I feel like a lazy mom lately because I don't feel like doing anything with my kids unless it requires little to no prep. 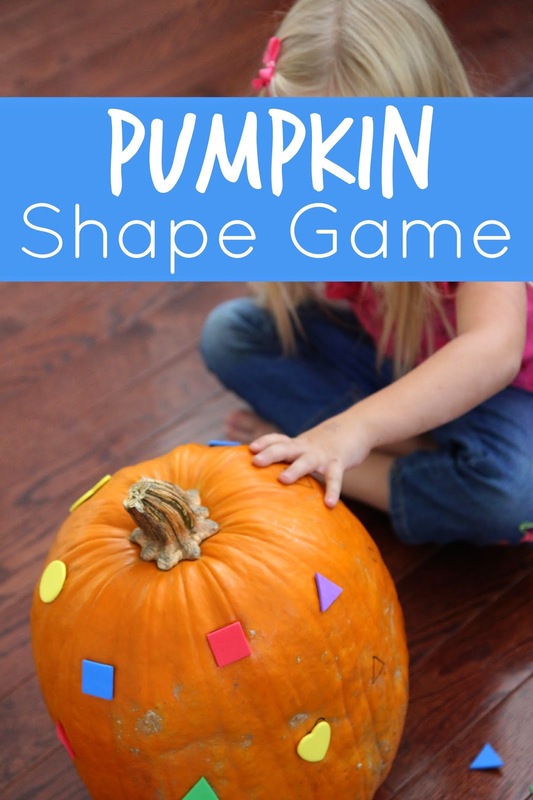 This shape pumpkin matching activity I created is amazingly easy to set up and gets kids moving their little bodies around too... so I would call that the perfect game. We went to the pumpkin patch earlier today and the kids had a blast... so we are loving all things pumpkins! We are even featuring pumpkins all next week in our Halloween Newsletter. 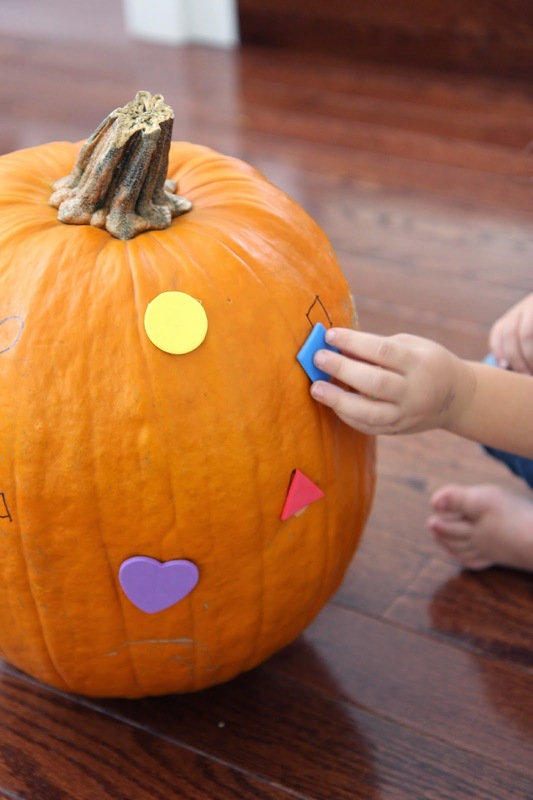 Learning about shapes is fun to integrate into pumpkin exploration, so this shape activity and our other Pumpkin Shape Movement Game were simple ways to explore shapes! We were inspired by The Imagination Tree's foam alphabet pumpkin so we decided to create our own game using foam shapes. For the shape pumpkin matching activity all you need are foam sticker shapes, little pumpkins, and a Sharpie! To play the game you first need to draw shape outlines all over the pumpkins. You want to try and make the shapes about the same size as the little foam shapes. You could even trace a few if you would like. You want to make sure each pumpkin has at least three shapes on it, maybe even more. Next, scatter the foam shapes all around the room where you are playing and put the pumpkins in a specific spot to justs sit. 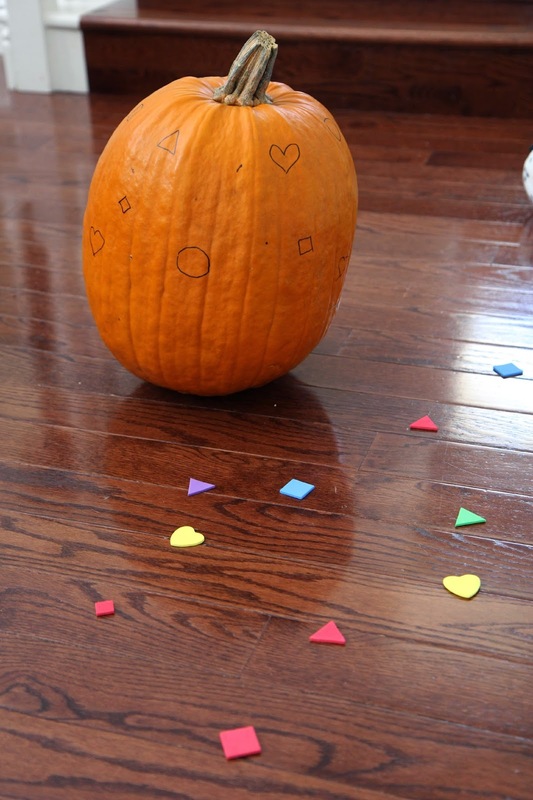 Have the kids run and find a foam shape and then try and match it to a shape outline on a pumpkin. Once they've matched the foam shape correctly then they can stick the foam shape to the side of the pumpkin! The game continues until all of the shape outlines on the pumpkins are filled! Wasn't that easy? Have any other favorite pumpkin themed activities to share with us? This post is part of our weekly Move and Learn Series. This year I am back joining with Hands On: As We Grow, The Pleasantest Thing, and Coffee Cups and Crayons to share some awesome (and active) learning ideas with you each week!